St. John’s Metropolitan Community Church (MCC) began as a small group of individuals that came together on the last Sunday in February 1976 to study the Gospel of John. Facilitated by The Rev. Willie White and his partner, Robert Pace, the group continued to meet and by June of 1976, voted to affiliate with the MCC denomination. Rev. White, who pastored St. John’s from 1976 to 1981, began a relationship with the Campus Ministry of N. C. State University which continues today. 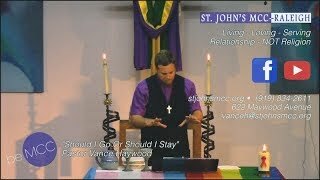 Other needs of the Lesbian and Gay Community were addressed by St. John’s in those early days including anonymous STD screening and rap groups. Within a year of its founding, the church began meeting at Community United Church of Christ. This mutually nurturing relationship lasted 17 years, until our first property was purchased. St. John’s second pastor, The Rev. June Norris, was the first heterosexual woman to be ordained in the United Fellowship of Metropolitan Community Churches (UFMCC) and was previously the pastor of an MCC outreach effort in Fayetteville. She served St; John’s from 1981 to 1988 and continued St. John’s participation both in the LGBT Community and the community-at-large, including offering testimony before the Raleigh City Council regarding non-discrimination clauses as well as participation in North Carolina Pride events. During her tenure, the diversity that has always been a central hallmark at St. John’s was strengthened. St. John’s found its third pastor, The Rev. Wayne Lindsey, among their membership. He had served as worship coordinator after the resignation of Rev. Norris, and after being asked to preach more and more often was then encouraged to apply to officially become pastor. In the mid-1990’s, St. John’s began a serious search for a worship center culminating with the purchase of a ministry complex at 805 Glenwood Ave.
During this time, St. John’s also became active in the Raleigh Religious Network for Lesbian and Gay Equality. Additionally, Rev. Lindsey worked with Lay Delegate Stan Kimer and the Gulf Lower Atlantic District (GLAD) to secure UFMCC’s membership in the North Carolina Council of Churches. During this era St. John’s offered two very different worship experiences, the AM service being more traditional eventually with the Morning Choir and the evening service being more evangelical even Pentecostal with music provided by the Voices of St. John’s. The Voices travelled to the UFMCC denominational General Conference and St. John’s received the denomination’s award for multi-cultural programing in 1997. Also during this time St. John’s Assistant Pastor Wanda Floyd left St. John’s to found Imani MCC in Durham. After Rev. Lindsey resigned as pastor in 1999, St. John’s had a lay led period of transition. Terri Steed (now Rev.) was worship coordinator and many guest speakers filled our pulpit. In July of 2001, St. John’s called The Rev. Brendan Y. Boone to serve as its fourth Pastor. Rev. Boone had been a deacon at New Life MCC in Norfolk, a long-time member and Clerk of the Mid-Atlantic District Committee, and most recently an Assistant Pastor at MCC-DC. Committed to “find them, bring them in, grow them up and send them out” Rev. Boone’s, stirring preaching and inspirational leadership blessed St. John’s with a new vision for ministry. Four clergy trained and were ordained with Rev. Boone’s leadership and many more lay leaders found their ministries. In 2014 Rev. Boone moved on from St. John’s at the end of December 2015 initially to follow his wife who made an essential career move to Florida. Rev. R. David Smith, former pastor of MCC Baltimore for 15 years, also a former member of the Mid-Atlantic District Committee and most recently Assistant Pastor at Vision of Hope MCC in Lancaster and York, PA, was appointed as Interim Pastor of St. John’s in March of 2016. He served during a time of intentional transition, preparing us for our next settled Pastor. St. John’s MCC found its fifth and current Pastor among the membership once again! The Rev. Vance Haywood was elected by the congregation unanimously in December 2017 and began his term as Pastor on January 1, 2018. Vance prior to becoming Pastor, had served the past 2 years as Worship Coordinator and was a part of the Preaching Team that worked together during our transitional period. Prior to becoming Worship Coordinator, Vance served as a Deacon for several years and was a member of the Board of Trustees. Today Vance is leading the church in our charge to Build Relationship and Not Religion by being the Church and putting our words into Action in our Communities. Look for us in our new home at 622 Maywood Avenue near Raleigh’s Farmer’s Market between Saunders and Lake Wheeler just off I-40. After many years in our own building on Glenwood we decided to find a more spacious building with more parking and all meeting spaces located on the same level. Come see what God has provided and what God is doing with us.